“Understanding the High Functioning Alcoholic” was published in hardcover in 2009 and Kindle by ABC-CLIO Publishers as part of their “Contemporary Health and Living” series, under the review of Harvard physician Dr. Julie Silver. The paperback was published in 2010 by Rowman and Littlefield Publishers. 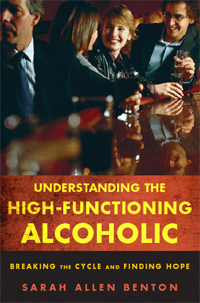 This book is an in-depth exploration of a hidden class of alcoholics. The author challenges the stereotype of the “skid-row” alcoholic by lifting the veil on alcoholics who believe they can hide behind their external successes. This book is intended to inform the audience that being successful professionally or personally and being an alcoholic are not mutually exclusive. Alcoholism may manifest differently in individuals, but all alcoholics have the same disease. Research, interviews and the author’s personal experiences as both a high-functioning alcoholic (HFA) and professional experience as a Therapist are integrated into this comprehensive work. The first part of the book is comprised of chapters describing characteristics, behavior patterns and experiences of HFAs throughout high school, college, graduate school and as professionals. Through the use of journal entries and reflective pieces at the end of each chapter, the author offers her first-hand perspectives of the thought distortions that this disease created within her own alcoholic mind. The second part of the book focuses on recovery and the obstacles that HFAs and all alcoholics face in terms of getting treatment. These include transcending the powerful levels of denial that exist within our society. The 12-Steps of recovery are examined as well as the difficulties that HFAs face when engaging in this recovery process. Finally, there is an exploration of the actions that sober HFAs find necessary not only to get sober—but to maintain long-term sobriety and find peace and spirituality within their lives. “An insufficiently appreciated fact is that alcoholism takes on many faces and disguises. The falling-down drunk is the most common and unfortunate stereotype of an alcoholic, but represents less than 10% of the 18 million alcoholics in America who suffer with it. _________________________________________________________________“Understanding the High-Functioning Alcoholic provides a thorough description as well as Benton’s experience of working a Twelve-Step program, but also addresses many important issues, including the role of spirituality and the controversy of controlled drinking, so often part of the discussion about the HFA, by providing information and positions from a variety of sources and giving the reader a chance to make informed conclusions. This work makes good use of realistic vignettes that do not resort directly to ‘worst case’ scenarios, but rather, illustrate the dilemma of the HFA in everyday settings and at all levels of development. Benton brings personal credibility and insight as she freely discloses her experiences as an alcoholic, including her own journey through her Twelve-Step program. She supports the assertion that the ‘bottom’ an HFA hits is often emotional in nature, and she applies the emotional dimension of an HFA in her first person accounts to provide a social, family, vocational and psychological picture. “Sarah Benton’s book Understanding the High-Functioning Alcoholic is a gift to both clinicians and clients alike. It is a thorough and insightful discussion of an often misunderstood and mistreated clinical group that frequently does not respond well to traditional psychotherapy, or psychopharmacology, or simply Twelve Step approaches. Sarah presents an integrated treatment approach in a highly personal and engaging way that truly bridges the gap between research, clinical work and moving personal experiences.